HCM City (VNA) – Delegates from APEC economies share experience in simplifying procedures for business registration at a workshop held by the APEC Economic Committee in HCM City on August 24 as part of the third APEC Senior Officials Meeting and related meetings. The event also updated participants on latest good practices and new regulations on business registration procedures in APEC member economies. Many delegates said information provided by the workshop is very useful for micro, small- and medium-sized enterprises, which usually face difficulties in getting licences. 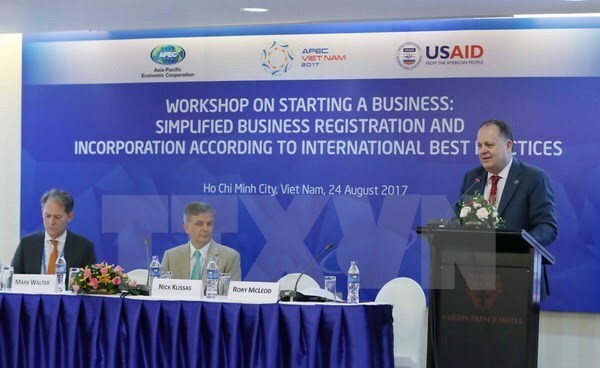 The problem is not unique to Vietnam, therefore simplifying business registration procedures holds the same significance to economic development in all economies, they said. According to Zhang Ming Shen from China, in order to simplify the procedures, the first thing is to reform institutions. The application of new internet-based technology is also important, he said. Experts agreed that the application of information technology and improvement of officials’ capacity are crucial to simplified procedures.